Okay, who shot up the Moon? "A Solar Eclipse is when the moon passes in between the Earth and the Sun. Sometimes it can have a strange effect on people. It makes them do things they normally wouldn't do. Gee, I hope our pals in Magicland are doing okay..."
Eclipses are inherently dramatic. That's why they're often used in fiction to punctuate dramatic events, or as a major plot element. They frequently mark something supernatural or magical in nature, even if the eclipse itself is a normal event. In Fictionland (unlike Real Life), the period of partial eclipse leading up to the complete obscurity of the sun (or moon) happens in minutes if not seconds, while the total eclipse lasts however long it darn well pleases. (Justified for places with smaller suns and/or bigger moons, although this is rarely addressed and opens further questions.) Alternately, the story can play the time straight and create a Race Against the Clock scenario when there's something that must be done during the eclipse (and there always is). Also, solar eclipses only completely block out the light in one relatively small area and the light reduction gets less pronounced the further away from the center of the eclipse, but in fiction tend to block out the sun completely wherever they happen to be. Lunar eclipses, on the other hand, can be seen anywhere on the nightside of the earth, but aren't nearly as dramatic since it's just a full moon with a red tint for a few hours (though a "blood moon" is often used in werewolf and vampire fiction). See also Convenient Eclipse. When something earthbound and much smaller casts a shadow on a plot-relevant location, that's Sundial Waypoint. Should not be confused with Plot Tumor, when a lesser subplot eclipses the main plot. In the finale of Digimon Adventure, the gate back to Earth from the Digital World took the form of a solar eclipse which lasted only two hours before closing/ending, necessitating that the Chosen Children quickly say their goodbyes to their mons and return home lest they risk never being able to return home or potentially being wiped as anomalies in the restoration of the Digital World. In the fourth season of Sailor Moon, The Dead Moon Circus arrives on Earth from their nightmare dimension through a solar eclipse. Later, when the Dead Moon's leader, Queen Nehelenia, breaks free of her magic mirror prison and temporarily takes over the world, her evil magic powers cause a permanent solar eclipse that covers the entire world in darkness that does not abate until Nehelenia is sealed away again by Sailor Moon. InuYasha: The anime decided to make Inuyasha be born during a lunar eclipse for the third film Swords of an Honorable Ruler. The manga itself never tells us anything about when Inuyasha was born. Every 216 years in the Berserk universe, an eclipse marks the birth of a new member of the Godhand, the group of demon gods that are the Big Bads of the setting. When it happens in the series, it marks the end of the Golden Age arc of the manga (and the end of the anime) and is the point where things turn from grim and gritty medievalesque Low Fantasy to straight up demonic horror, as Griffith, one of the three principal characters, goes bad in a big way and sacrifices the Band of the Hawk to become the fifth member of the Godhand. Everything goes straight to hell for Guts and his True Companions as a direct result of Griffith's actions. In Saint Seiya, the God of the Underworld, Hades, aligns all the celestial bodies in the Solar System in order to bring about the Final Eclipse, which will result in The Night That Never Ends. The solar eclipse in Umi Monogatari takes quite a bit longer than expected, which is even lampshaded by the people watching it. It also signifies a turn to a much darker mood in the series. In Fullmetal Alchemist, there's a solar eclipse during the Grand Finale. 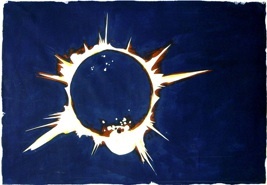 This may have something to do with the alchemical symbolism related to the Sun and Moon (and the Sun being devoured). In real life, however, the moon during an eclipse doesn't leave such a nice defined shadow, such as seen here ◊. The fandom has taken to calling this "The Eclipse" in reference to Berserk, since it turns out to be critical to Father's plan. And Hohenheim's. Specifically, using the Umbra AS A TRANSMUTATION CIRCLE. In the 12th Pokémon movie, Pokémon: Arceus and the Jewel of Life, Damos was supposed to return the Jewel of Life to Arceus on the date of the next eclipse. He didn't. It does get returned, though. The eponymous temple in Pokémon Ranger and the Temple of the Sea only appears during a total eclipse. Nurse Angel Ririka SOS aired during a year when a partial solar eclipse occurred in Japan, and eclipses get mentioned in a couple of episodes. The main example is episode 16, where it's used to symbolize the heroine's mental state. Yu-Gi-Oh!s Ultimate Evil and last Big Bad, Zorc, whose is more or less the Physical God embodiment of the Shadow Realm and desires to drown the world in eternal darkness, becomes nigh-invincible once he invokes The Night That Never Ends via a unnatural solar eclipse, which lasts for the better part of an hour as he curbstomps the Egyptian God Card monsters and the Blue-Eyes White Dragon, and subsequentially wrecks havoc virtually unopposed through the capital of Ancient Egypt, before being stalled by Kaiba and his Blue-Eyes Ultimate Dragon, and is ultimately defeated after the heroes finally manage to summon the Yugiohverse's Ancient Egyptian God of Good and Zorc's antithesis, Horakhty, after which the abnormal eclipse dispells. In The Vision of Escaflowne, the Earth itself, known as the Mystic Moon, moves in front of the Sun during Millerna and Dryden's wedding. It appears to be a consequence of the luck enhancement that Naria and Eriya receive, but it's actually a result of Hitomi abusing her prophetic/destiny-altering powers. The animators actually missed an excellent opportunity here. The Earth is surrounded by a blue halo during the eclipse, but it would actually appear red; perfect for the Curb-Stomp Battle that takes place. Considerable importance in The Familiar of Zero, where it is revealed that the eclipse is one of few instances where travel between Saito and Louise's worlds is possible. This is how Siesta's grandfather made it across in his Zero fighter. This was put to good use in the finale of season four, when Saito broke into a military base, stole a jet and flew it into the eclipse, arriving just in time to save Louise from a giant, death-bringing dragon of the apocalypse. In the climax of Brave10, an eclipse marks Isanami's Superpowered Evil Side appearance. Agni's Philosophy: The summoning ritual could only occur during a solar eclipse. It damn near passes before Agni is able to complete the ritual. The DCU has the villain Eclipso who is the reason that eclipses happened alarmingly often in the series, especially early on. At first, Eclipso is a villain who only came out of his host's body during an eclipse, he has far surpassed that. And back in those days, the host quite sensibly tried to avoid being around when there was any kind of eclipse. You'd think that with an almanac and a modest travel budget, that wouldn't be hard, but he seemed to be really bad at it. When Tintin and friends are due to be executed by the Inca, he requests they do it on a certain day: the day of an eclipse, when he appeals to the sun to spare them. It convinces the Inca. Leetah in ElfQuest has a phobia of eclipses - and it later turns out that her long-time suitor Rayek was born during an eclipse, which might explain why they've always had such a troubled relationship. Interestingly enough, the eclipse that surrounded Rayek's birth was considered a good omen by the elves, who had been experiencing a years-long drought and were glad of the brief respite from the sun's heat. The interpretation was that Rayek would grow up to become a tribal protector, interposing himself between them and danger the way the moon interposed itself between the village and the harsh sun. Friendship is Witchcraft features an episode centering on the cult waiting for an eclipse to summon a world-destroying beast. Drives the plot for A Total Eclipse Of The Fun within the Triptych Continuum. The story begins when Luna decides that the only thing she wants to celebrate the second anniversary of her Return is a total solar eclipse. Given the cycle of Sun and Moon in Equestria, this can't happen unless the sisters deliberately arrange it, as the two celestial bodies are otherwise never in the sky at the same time. (In this setting, eclipses are effectively an artifact from the era of Discord, one which only Celestia and Luna remember.) Parts of the public don't take too well to the concept since, you know, they're bringing back something from the age of Discord which blocks out the Sun. The Stars Will Aid Their Escape: The plot just happens to coincide with the first solar eclipse since Luna's return from banishment. Naturally, it ends up being crucial to Herald's plans, as not only is it a component of the alignment required to release the Outer Gods, but it also leaves both Princesses weakened enough for him to banish them outside reality. The "Rite of Spring" segment of Fantasia ends with a devastating earthquake (accompanied by new mountains forming) occurring during a solar eclipse. In Pitch Black, the characters are on a moon of a large gas giant planet, and the planet eclipses the star as seen from its moon, instead of the other way around. The planet rapidly goes from "just touching the sun" to "completely covering the sun" in a matter of moments. As soon as the planet covers the sun, the rest of the film is spent in the titular condition. Given that the planet is much larger in the sky than the sun is at that distance, a long eclipse is reasonable. Interestingly, a full model of the solar system and its movement is found by the characters and it would have provided this information in detail, however it is only shown in passing and the characters themselves only give it a quick glance. It's brought up later that the planet and the moon in the model were moving together at the same rate which means a long night ahead, but the model wasn't examined in detail. The Disney movie The Watcher in the Woods has an important backstory revolving around a solar eclipse, and its recurrence triggers the current events. In this movie, and others such as the Esperanto-language Incubus, everyone is surprised by the eclipse, when in real life the site would be crawling with astronomers and tourists whod known about it years in advance. In Apocalypto, a solar eclipse occurs while Jaguar Paw is on the sacrificial altar. It saves his life, as the priest interprets the eclipse as a sign that the gods' thirst for blood is sated. This eclipse is followed that very night by a full moon. Audrey II appears out of nowhere during a total eclipse of the sun in Little Shop of Horrors. Ladyhawke got an eclipse that allowed the titular bird/woman and her wolf/man lover to be together rather than for those few moments at dawn and dusk when each was changing shape. It is standing together like this before the evil bishop that cursed them that ultimately breaks their curse. Though this "eclipse" occurs the day after a full moon (which would be impossible since solar eclipses can only take place at New Moon). Either the writers fail astronomy forever, or it really was supposed to be a miracle. Although the novelization, by SF writer Joan Vinge, fixed this. Also happened in another '80s fantasy film, Dragonslayer, though there it was more due to the Rule of Cool than anything else. Lara Croft: Tomb Raider. The Big Bad's plan involves an astronomical conjunction of every planet in the solar system, which also includes a solar eclipse. Dragonball Evolution: "We have to get the Dragon Balls before the eclipse." The very words that made the internet go "NOOOOOOOOOOOOOOOOO!!!!" From Dusk Till Dawn 2: Texas Blood Money has a particularly egregious "plot-timed" eclipse, where the moon races across the sun and then stops dead, letting the vampire villains come out from under cover for an extended period. In the British science fiction disaster movie The Day the Earth Caught Fire a total eclipse of the sun occurs over London when it isn't supposed to. This is one of the first indications that the Earth has been knocked off course by nuclear testing. The Death Star creates an artificial eclipse of Jedha's sun in Rogue One, just before it begins its test run and blasts the planet's main city into atoms. "Nightfall (1941)": Lagash is a world with six suns, whose inhabitants have never known darkness of any kind, as there is always at least one sun visible at any given moment. When a once-in-2049-years eclipse occurs and plunges their world in darkness, the vast majority go completely bonkers. Nightfall (1990), co-written with Robert Silverberg: Its setting is a world with 6 suns, whose inhabitants have never known darkness of any kind, as there is always at least one sun visible at any given moment. Characters use 'godlights' in their rooms to keep them lit even while they sleep, and subjecting anyone to darkness causes a severe psychological reaction. When a once-in-2049-years eclipse occurs and plunges their world in darkness, the vast majority go completely bonkers. An eclipse happens in the second Nightrunner book. It was a prophetic event and did indeed last a curiously long time. The title character in A Connecticut Yankee in King Arthur's Court uses foreknowledge of an eclipse to convince the medieval denizens that he has supernatural abilities. The Heralds of Valdemar novel The White Gryphon introduces the Heighlei, an incredibly rule-bound society that only allows large-scale societal changes once every 20 years, during a solar eclipse. It provides the Race Against Time when the protagonists are framed for murder: they must clear their names before the eclipse to ally with the Heighlei. Stephen King's novels Gerald's Game and Dolores Claiborne are linked via an eclipse (the solar eclipse of July 20, 1963, which happened in real life). They were originally conceived as a single volume. The medieval legends of Saint Olaf, as found in, among other versions, Snorri Sturluson's Heimskringla, state that a solar eclipse occurred immediately after Olaf's death in the Battle of Stiklestad, Norway 1030 AD (certainly a divine lampshading of Olaf's holiness). Since astronomy tells that a near-total solar eclipse happened only a month after the traditional date of the battle, this is in all likelihood only a pious swindle. In Star Trek: Articles of the Federation, it's revealed that to the dominant native religion of Lembatta Prime, a solar eclipse is a sacred event. The planet shuts down entirely during an eclipse, forcing Federation President Bacco to postpone her state visit. In Sunwing, the second book in the Silverwing series, the entire plot revolves around Big Bad Goth attempting to bring his god Cama Zotz into the world by sacrificing 100 creatures during a solar eclipse. The final battle becomes more about the heroes trying to free as many of captives as possible to avoid this. The Strain has an eclipse over New York City that last for about ten minutes, which allows the vampires to move about the city undetected. In Warrior Cats, an eclipse occurs in... er... Eclipse. The cats thought the sun died, and a battle between all four Clans occured during said eclipse. One of the lesser-known Dragonlance novels featured a multiple eclipse of Krynn's moons. White Solinari, red Lunitari, and black Nuitari lined up to form a big bullseye in the sky. A conjunction of two or all three of Krynn's moons is a part of the Dragonlance campaign world, being a major power boost for wizards. N. K. Jemisin's Inheritance Trilogy: When the Old God Nahadoth is really angry over an unsolved deicide in the city of Sky, he shrouds the city in an unending solar eclipse and gives the natives 30 days to resolve the situation. Weirdly, the eclipse is only visible within the city — or to people from the city, no matter how far they go to try to escape it. In Heroes, the characters' powers were retconned came about after an eclipse, and were taken away temporarily during another eclipse, one that lasted hours. The eclipse also covered the entire planet the first time, and did the second time as well. It's strange when Peter in New York saw the eclipse at the same time as Claire in Texas, but it's downright stupid that Hiro, who's in Japan sees it at the same time as well. In EastEnders, a couple have their wedding at the moment of the eclipse. Particularly jarring as it was set around the event of a real eclipse (but filmed beforehand) and the one on TV was much better than the real one due to bad weather. In Buffy the Vampire Slayer, the Mayor ascends at the moment of eclipse. This allows his vampires to come attack the students as well. Although the eclipse was a magical effect brought on by the Mayor's transformation rather than a natural event, which could explain some of the oddities. On Angel The Beast also used a ritual to cover the sun with magical darkness. The effect only extended to Los Angeles, though it would have spread if they hadn't managed to undo it. It made LA a prime vacation spot for vampires while it lasted. In Kamen Rider BLACK, the hero and his fated antagonist were both born during a solar eclipse, leading the evil organization Gorgom to groom them into the prophesied Century King. The baddies even refer to Kamen Rider Black as "Black Sun" and his evil counterpart as "Shadow Moon," highlighting this origin. Eclipses as an origin crop up again in the 2012/2013 entry in the franchise, Kamen Rider Wizard. Specifically, a magical ritual during a solar eclipse led to the creation of the villains as well as of Wizard himself. During the Green Ranger arc of Mighty Morphin' Power Rangers, Rita uses her magic to cause a total solar eclipse. This cuts the solar-powered Megazord off from its power source, weakening it to the point where her agents can defeat it (Until it gets repaired in time for the finale). Given that this was fairly early in the first season, one has to wonder why she never tried to do this again, or send monsters down on new moon nights, when there would be no sun or even moonlight to power the ranger's mecha. Still, even weakened like that, it took the combined power of Goldar, Scorpina, and the Green Ranger grown to giant size to defeat the Megazord, and they didn't wreck it, they just split it and enabled Rita to trap the Zords. Also when Master Vile pulled a similar trick later, Alpha and Zordon were able to use the Command Center to break the spell. Rita was only able to get away with it on this occasion because the Green Ranger had cut the Rangers off from Zordon. The real-world reason is that good night-fight scenes were tricky and expensive to shoot at the time. In Tensou Sentai Goseiger, Brajira intends to carry out the final stage of his plan during a solar eclipse since that is when the Earth's defences are at their weakest. On Sleepy Hollow, an eclipse marks the rising of the Horseman of War. As well as the present day anniversary of when said rising. Midsomer Murders featured an episode where someone was murdered at an observatory during a solar eclipse. Unlike most cases of this trope, the timing of the eclipse was played realistically, and plenty of people had gathered to see it. The Musketeers has the King, Queen and many others go to an observatory to witness a total eclipse, only to be held hostage by the astronomer. Again, the timing of the eclipse is realistic. Oz has Binary Suns in Tin Man, and they're both set to slip behind the moon at the same time in a rare double eclipse. The Wicked Witch is attempting to take advantage of this once-in-a-lifetime opportunity to bring about The Night That Never Ends. In the Spellbinder pilot, the protagonist goes on a field trip into the woods in order to watch an eclipse. While there, the teacher tells the students about how, in the old days, people thought that an eclipse was a dragon swallowing the sun and offered human sacrifices to appease the dragon. When students laugh at the stupid primitives, the teacher points out that they kept believing it because the sacrifice worked every time. Later, after he ends up in the After the End parallel world, he has trouble convincing a local girl to help him, so he remembers his teacher's story and plays it out, when the eclipse happens (at the same time in this world as in ours). She agrees to help him, if he returns the sun. He does. In Teen Wolf a lunar eclipse takes away all werewolves powers in the affected area. This is a crucial plot point allowing the Big Bad of the season, an evil druid, to attempt to kill the other big bad of the season, an incredibly powerful alpha werewolf. In Marilyn Manson's Concept Album Antichrist Superstar, an eclipse is one of the phenomena caused by the titular Misanthrope Supreme ascending to become a Physical God, in an arc that ends with him destroying the world. The time has come for bitter things." Justified in Mall Fight, as the eclipse that occurred at Xandus' reappearance wasn't natural. In Exalted, the celestial bodies are the earthly representations of the major gods of the setting, and their movements are completely under their control. Accordingly, astrology has real power, and significant events in Creation are often accompanied by unusual celestial occurrences. Solar eclipses in particular are auspicious omens, as "the Unconquered Sun and Luna become one, and the day dims sufficiently to reveal the Five Maidens. At this moment, the unity of heaven is revealed for all to see." The opening of the Jade Prison was accompanied by the first eclipse in over two thousand years, ever since the Usurpation. In Scion, an interesting effect can be achieved by combining one of the highest abilities of the Sun and Moon domains (not necessarily from the same person). Both have the ability to pluck a small copy of their respective celestial body out of the sky, and then save it for later - the Sun can be used to create a sun-crown that absorbs energy-based attacks, while the moon creates a rapidly-moving disc that blocks projectile-attacks. If a single person activates both of those effects, they combine to form the awesome-looking 'Eclipse Crown', granting both bonuses with an added boost. In Dark Heresy the Tyrant Star sometimes appears like this (though whether it is just eclipsing the sun, replacing it or if it is all just a hallucination is left up to the GM). Bad things happen when it does. The plot of the Call of Cthulhu campaign Masks of Nyarlathotep'' hinges around a bunch of cults of said deity trying to open a massive interdimensional gateway using a total solar eclipse, a rocket, and the birth of an eldritch abomination as the focus. In Dark Souls III, an eclipse occurs when the Age of Fire comes close to the end, specifically, when you defeated 3 Lords of Cinder. And it resembles a giant Darksign. In Diablo II, a sudden unexplained eclipse turns out to have been caused by evil magic, and the heroes undertake a quest to destroy the spell at its source. Once this is done, daylight returns instantly. The last act of Ōkami takes place during the Day of Darkness —a solar eclipse that will last forever if the Sun Goddess Amaterasu falls to the Lord of Eternal Darkness. The full eclipse itself starts with the rise of the Emperor of Eternal Darkness, Yami, and ends when Ammy redraws the Sun in the sky, so it can be anywhere from a few minutes to an hour, but the initial phase of umbra lasts for several hours. When the characters go through a Portal to the Past several days after a full-moon festival in another town, the first clue that something is wrong is that the moon is full again. The backstory and Final Boss of Romancing SaGa 3 relies on the Death Eclipse, an event that occurs once every 300 years. Those that survive the event are taken to The Abyss, where the Four Devil Lords and The Destroyer awaits, who will then proceed to destroy the world no matter the outcome of the battle (even though winning gives the heroes the chance to re-create it all). In Terraria, an Eclipse is one of the most dangerous phenomenons, changing the usually chipper music with an oppressing organ melody and forcing you to spend a whole day battling or escaping from large throngs of powerful night creatures such as vampires and mudmen. Dracula is apparently killed off for the final time in 1999 due to/during an eclipse. Another eclipse, set in Japan in 2035, sets the plot of Aria of Sorrow in motion: as Dracula's Castle is sealed within the eclipse (not in the moon, but in the eclipse itself!) it is only during an eclipse that it's actually possible to reach the castle. At the climax of The Darkness, a solar eclipse covers the city in darkness, not only allowing you to access your darkness-based powers in the middle of the day, but also apparently supercharging them. The eclipse is unrealistically long, but at least had the good grace to start slow - it actually takes several minutes from the point where it starts to show, and until the eclipse becomes complete. Two-thirds of the way through Golden Sun: Dark Dawn, a piece of forbidden (but unavoidable) Magitek triggers the Grave Eclipse, an event that covers half of Angara in shadows where superpowered monsters roam freely, and Anyone Can Die, even the resident Badass Normal. Your goal for the last part of the game is to dispel the unnatural Eclipse. In Sonic Riders, a solar eclipse opens a chasm in the sands and creates the Dark Desert racetrack. The eclipse will last however long it takes for the race to finish. In Super Street Fighter IV There is a selectable stage that places the fighters in Africa during a solar eclipse, however, the Eclipse comes, lasts for a few moments, and then passes as the fighters toss Hadoukens and Shoryukens at each other. And is only there to look pretty. The climax of Embodiment of Scarlet Devil has Reimu facing off against Remilia Scarlet on the night of the Scarlet Moon, a lunar eclipse that has turned the full moon blood-red, when Remilia's power is at its peak. In Infernal, there's a special once-a-millennium kind of eclipse which is the only time that God isn't watching what happens on Earth. One of the villains is an angel who want to use this window of opportunity to "correct" The Evils of Free Will, brainwashing humanity into being good while the Creator isn't looking. In Sengoku Basara: Samurai Heroes, the Battle of Sekigahara, which is generally the climatic battle of many characters' storylines, is represented by an eclipse. This is because the leaders of the Tokugawa and the Ishida armies, Ieyasu and Mitsunari, are represented by the sun and the moon in-game. In Ninja Gaiden, Ryu is told of a prophecy of a demon being unleashed when the "black moon" shines. Near the game's end, after defeating the Big Bad, a lunar eclipse occurs during the cutscene. Cue the Final Boss. In the SNES classic Chrono Trigger, the climax of the side-quest to bring Crono back to life happens during a solar eclipse: the team returns to the exact moment of the event — frozen in time — exchange a life-like replica for the real Crono, and bring the latter back into the time stream. Metaphorically played straight, as bringing the main character back to life is a side-quest, and irrelevant to the over-arching plot. It's not explicitly remarked on, but as you begin succeeding at missions into the eponymous structure in Darkest Dungeon, the Hamlet sky turns blood-red, and an eclipse is clearly visible in it. It was a part of the summoning of Ygrassnoj in The KAMics. "The Ascension" in lonelygirl15 took place on the day of an eclipse, for implied religious reasons. The second season of The Adventures of Puss in Boots concerns a race against time to complete a spell to restore the barrier that protected the town of San Lorenzo before some unspecified disaster hits during the eclipse. It turns out the entire spell and prophecy that came with it were fake, and instead the spell is to summon an ancient evil during the eclipse. In Avatar: The Last Airbender, the main characters use the Day of Black Sun to attack the Fire Nation. Also, a lunar eclipse had been utilized by the Fire Nation to attack the Northern Water Tribe. In explanation, Firebenders are powered by the sun, and Waterbenders by the moon; an eclipse of their respective heavenly body leaves them powerless. The lunar eclipse was artificially induced by the temporary death of the Moon Spirit. The solar eclipse only lasted about 8 minutes, providing an unusually realistic interpretation, aside from the fact that King Bumi could also see it from way on the other side of the globe. Though, the world of Avatar is significantly smaller than ours, so it is possibly justified. Unfortunately for the heroes, Fire Lord Ozai was Genre Savvy enough to just hide and wait out the eclipse. Darkwing Duck parodied the scene in A Connecticut Yankee in King Arthur's Court described below in a Time Travel episode. Darkwing attempts to use foreknowledge of an eclipse to terrify the locals by pretending to block out the sun, but the eclipse he's predicting doesn't occur until the day after he makes the threat, and so ends up stalling for 24 hours until his "magic" pays off. DuckTales (1987): In the episode "Allowance Day". Having perpetrated a Zany Scheme that has inadvertently convinced the whole world that the date is one day ahead, Huey, Dewey and Louie use an eclipse predicted by their almanac to set the record straight. note TaleSpin did a very similar plot a few years later in "The Time Bandit", using a comet. There was a Looney Tunes TV Special titled Bugs Bunny in King Arthur's Court where Bugs Bunny traveled back to medieval times and got out of a pickle by declaring he would put the sun out just before an eclipse occurred. He was suddenly worshiped as a powerful God, being from the future he knew an eclipse was about to occur at that moment (it was still AWFULLY convenient for him). In the episode "Marge vs. the Monorail", the runaway Monorail (which is solar-powered) halts briefly due to a total solar eclipse which nobody realised/remembered was due in Springfield that day — only to start up again as the eclipse passes totality. This is realistically portrayed as taking under a minute (real-life solar eclipses can last any time from an eyeblink to (under the most favourable circumstances) about 7-8 minutes). A man-made eclipse occurs in "Who Shot Mr. Burns?". "The Seven-Beer Snitch" has a gag where someone says that with a new concert hall, Springfield will no longer be known as the city that's afraid of eclipses. It then shows the newspaper headline "GOD STEALS SUN; Mayor offers sacrifices." "At Last Long Leave" features a photograph of a townwide riot taking place during an eclipse. Homer: Sorry, Dad, I thought the dragon would't cough the moon back up. Grampa: You idiot, the dragon always coughs the moon back up! Jonny Quest: The Real Adventures has an episode that's aptly-titled "Eclipse." The plot revolves around a lunar eclipse that happens every 50 years: a succubus-type monster disguised as a beautiful woman has only the duration of the eclipse to absorb the Life Energy of another young woman and keep itself alive until the next eclipse. When the monster chooses Jessie as its next victim and enthralls Hadji to get her, it's up to Jonny to come in and save the day. 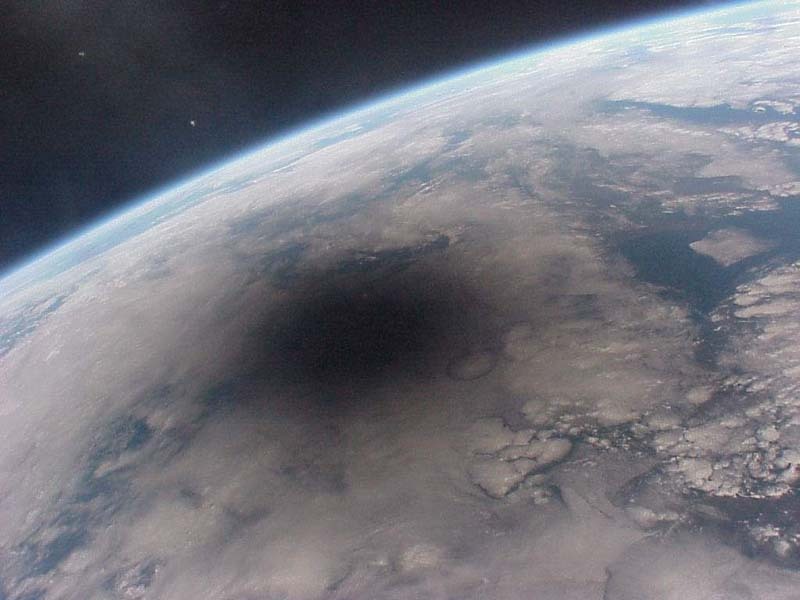 Men in Black: The Series had shadow aliens attempt to lock the moon in position for an eternal eclipse. Astronomy failing aside, they at least made a normal eclipse only last a few minutes. The Amazing World of Gumball episode "The End": Through a complicated series of events, Gumball and Darwin are convinced that an upcoming solar eclipse means the end of the world. The actual event proves to be a little underwhelming. Moon: Ooh, you've just been mooned! Sun: What is wrong with that guy? An episode of Kassai And Leuk had an eclipse happen at a moment when the party was relying on Marana's sun-triggered gazelle form. In The Powerpuff Girls episode "Boogie Frights", the Boogie Man blocks out the sun with a giant disco ball, and the girls have to destroy it Death Star style. At the very beginning of the first episode of Samurai Jack, an eclipse is what frees Aku from his prison, setting the series' events in motion. The powers of Queen Angella from She-Ra: Princess of Power were tied to moonlight, which is why a couple of lunar eclipses proved to be a serious problem requiring She-Ra to either speed up time or drag the moon out of the shadow. In The Smurfs cartoon show special "My Smurfy Valentine", Chlorhydris the witch must find a special cat that would unlock the power of a magic wishing well during a rare solar eclipse on Valentine's Day that happens only once every 1000 years. In Detentionaire, the mysterious pyramid underneath the school can only be opened during the eclipse. The Council has plans to artificially re-create the eclipse, since their plans were messed up the first time they tried them. In the Star Wars Rebels episode "Out of Darkness", Hera and Sabine are stranded on an asteroid with an abandoned Republic base; it quickly becomes apparent that said base was abandoned due to an infestation of vicious beasts called Fyrnocks. Fortunately, the Fyrnocks hate sunlight, but another asteroid is about to block out the sun, long enough, according to Sabine, to become Fyrnock food. The Beatles follow a quirky scientist to a tropical island to see a lunar eclipse in the episode "Mr. Moonlight." In Ben 10, during the episode "Tough Luck", the sorcerer Hex attempts to use the Keystone of Bezel to recreate five other charms that Gwen destroyed in a previous epsiode. The ritual he performs to accomplishthis takes place during a solar eclipse, and it would've worked had Ben not turned into Wildvine and crushed the Keystone. In The Penguins of Madagascar, tired of Julien's antics, the chimps decide to take advantage of an eclipse and Julien's faith in sky spirits to trick Julien into changing his ways. Season 1 of Dawn of the Croods ends with a solar eclipse that causes the cavemen to panic, thinking someone's stolen the sun. the episode ends before the eclipse is resolved, leading to a cliffhanger. In Elena of Avalor, a moth fairy named Orizaba returns to Avalor every time there's a total solar eclipse and tries to find a magical stone that will prevent the eclipse from ending, creating The Night That Never Ends.